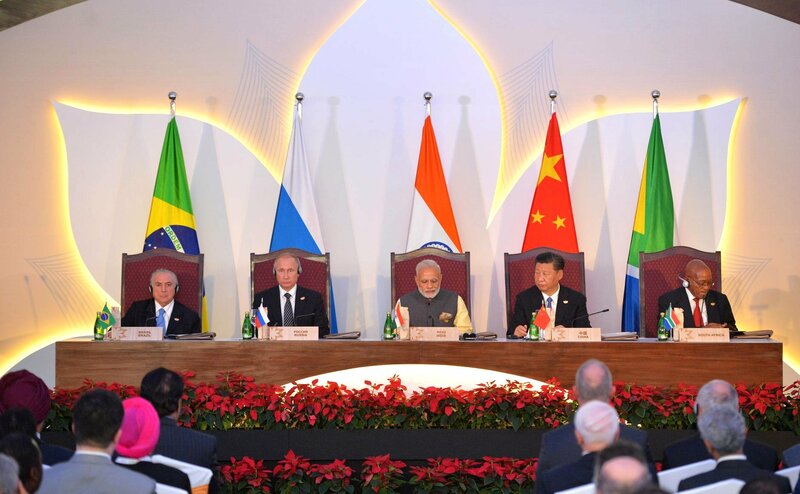 BRICS leaders at the summit in Goa. In a world of uncertainties and crumbling western economies, the five-member BRICS group is more – not less – relevant. A lot of people want to see the BRICS fail. Western nations, in particular the United States and Britain, are prime suspects. However, there are plenty of unwitting commentators in the emerging world who are playing into the West’s hands. Each year, as the BRICS summit draws near, the cacophony from these haters grows louder. Questions about the viability and relevance of the BRICS are raised in the media. During the build-up to the Goa summit this year, the refrain was similar but with the background buzz that the India-China rift over Pakistan-backed terrorism would derail the summit. However, the predicted outcome of an implosion didn’t materialise and, on the contrary, with India and Russia inking the S-400 missile deal, Goa 2016 turned out to be a memorable event. Since many innocent readers may have been misinformed by the compromised commentators – who will certainly be back like a bounced cheque next year – here’s a ready reckoner on the BRICS group. So the next time you hear remarks that the BRICS are collapsing, don’t lose sleep over the issue. Most of the global multilateral institutions that exist today are no longer relevant. The IMF and the World Bank, for instance, were founded during the closing years of World War II. In geopolitical time, that’s ancient history. Similarly, the G-7 appears to be on life support and the OECD (Organisation for Economic Cooperation and Development) is no longer a leading organisation. With the western economies perched on monetary and budgetary cliffs, the five BRICS members provide a stable alternate force that offsets the West’s decline. Both China and India continue to experience high economic growth and are on course to become mega economies that will completely dwarf the West in the coming decades. Beijing’s growth may have fallen under 7 per cent but that’s enough to add the equivalent of Holland’s national income to the Chinese GDP. Bottom line: without the BRICS, the world economy will experience 1929 all over again. Uday Kotak, executive vice-president of Kotak Mahindra Bank, feels India should quit the BRICS coalition because of the slowdown in four of the five economies. His view has been echoed by several so-called experts. But curiously, have you ever heard any economist or banker say the OECD must disband because it has basket cases such as Greece or terror exporters such as Turkey? If the UN fails to discuss relevant political issues, the international body is considered a failure. But BRICS is not a platform that was created for discussing politics. The primary role of the five-member group is to remove the West’s grip from the levers that control the world economy. By establishing their own New Development Bank, the BRICS have ensured that the IMF is no longer the world’s lender-of-last-resort. In this backdrop, fears that bilateral issues involving India and China will wreck summits have consistently proved to be baseless. Take Goa 2016. While the Goa Declaration mentions terror, the focus of the summit was not terrorism at all. Sure, Prime Minister Narendra Modi took a shot at Pakistan, describing it as the “mothership of terrorism”, and China defended its ally by saying it had made “great sacrifices”. But both New Delhi and Beijing were merely playing to their respective galleries even as the real summitry was happening behind closed doors. To be sure, politics can be tabled if it’s a side dish – like Syria was a couple of years ago – but issues with the potential to derail the summit simply have no place in BRICS. Critics of the BRICS often point to the India-China border issue as evidence of serious problems. But this misses the point. There always will be different opinions and views among the BRICS countries – just like there are differences among NATO or European Union members. Unlike NATO or the European Union, where the member countries have more or less the same goals and are also of the same racial stock, each of the BRICS countries is different. However, their membership of BRICS gives them a common goal – development. As emerging countries, they are focussed on raising their standards of living. The fact that they are united as a group, despite such stark differences in national goals, opinions and geopolitical rivalries and even outright hostilities, points to the viability of the BRICS.